Each of the evil Batmen in DC’s Dark Nights: Metal event are manifestations of Bruce Wayne’s deepest insecurities about himself, styled as different members of the Justice League. This week’s Batman: The Drowned introduces the Dark Multiverse’s answer to Aquaman, and she’s the most fascinating of the Dark Knights. So far, each of the other Dark Knights we’ve met has been a version of Bruce Wayne who, after hitting a particular breaking point, turns on one of his fellow Leaguers, steals their powers, and becomes a corrupted amalgam of himself and his former allies. Also: all of these Bruce Waynes have been men. The Drowned, written by Dan Abnett and illustrated by Philip Tan and Jason Fabok, tells the origin story of the only woman counted among the Dark Knights—and in doing so, raises a number of interesting questions about some of the larger concepts at work within Metal as a whole. Like all of her fellow Dark Knights, Bryce Wayne came from a universe shrouded in an existential darkness, but that didn’t stop her from fighting to rid her world of crime and eventually finding love in one Sylvester Kyle. Let’s take a moment to appreciate that quality cat pun. Though her codename is never given, Bryce lived a life much like Bruce’s, complete with a Batcave, badass armor, and an inherent need to protect the innocent until Sylvester was murdered by metahumans. Sylvester’s death devastated Bryce, but it left her with a renewed resolve to defend the world against metahuman threats in particular, an obsession that would prove to be useful when her universe’s Aquawoman (an Aquaman analogue) made contact with the surface world. Though Aquawoman and the Atlanteans claimed to have come in peace and arranged peace talks with leaders from the surface, the meeting of worlds eventually collapsed into an all-out war that brought Bryce beneath the ocean. It’s unclear whether the Atlanteans themselves were ever actually truly trying to invade the surface, but to Bryce, their foreignness and superpowers were reason enough to distrust them. In retaliation for Bryce murdering Aquawoman, the Atlanteans made one last-ditch effort to strike back at the surface by flooding Gotham entirely, a move that inspired Bryce to become something she’d once fought so hard to eradicate from the world: a metahuman. She experiments on herself with mutant DNA to imbue herself with all the abilities of the mainstream continuity’s Aquaman and Mera. Bryce then engineers an army of aquatic demons known as the Dead Water that she’s able to summon across dimensions. 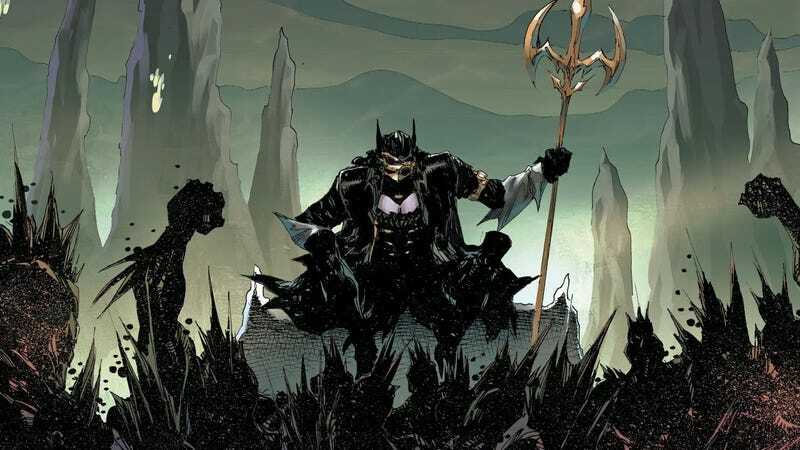 In time, Bryce claims the drowned world as her own, and in time is approached by the Batman Who Laughs to join the Dark Knights in their crusade against the brighter, mainline Multiverse. Compared to the other Dark Knights’ one-shots, The Drowned is by far one of the most imaginative and interesting, and it begs the question as to why more of the other universes aren’t as wildly different. On the surface, Bryce Wayne reads as a Batman analogue with two X chromosomes, but the ideas at work within her universe are far more complex. At one point, when Bryce meets the mainstream Aquaman, she recognizes him as being an alternate version of the same Atlantean monarch she killed. This implies that her universe was entirely populated by gender-swapped versions of DC’s characters, which means that the power dynamics of her world were radically different. It’s possible that Bryce was her world’s greatest detective and a member of a league of women who defended the universe from all manner of villains (again women) who would have seen its end. Her Gotham was terrorized by a rogue’s gallery of lunatics that she worked with a chosen family of predominantly women to defeat. It’s easy to write off gender reversal as a shallow attempt at being edgy or deep. We’ve seen glimpses of such worlds before from both Marvel and DC. But to actually take the concept to its greatest narrative heights requires a true deconstruction of the way that we tell stories about power and heroism. It’s one thing to see the Amazons running things on Themyscira, but imagine an entire comics universe defined by its female heroes and villains. This same concept applies to basically any identity that isn’t straight, white, male, and cisgender, and it’s that fact that elevates The Drowned above the other Dark Knights’ stories so far. There’s an entire Dark Multiverse-worth of opportunity for stories that challenge us to rethink and reimagine heroes we know and love as compelling, different iterations of themselves that better reflect the rest of the world.